Now that we’re officially into December, I’m allowing myself to get into a festive mood. I’m normally a Grinch by this time of year — one of the drawbacks to working in advertising, as I’ve been reading about reindeer since JULY. But then, I felt a spark in my seasonal spirit as I scanned the aisles of local stores. The apartment was looking a little sad, so I put together a little winter wonderland to ward off Grinch-y tendencies. Any Target or Walmart in your area should carry similar items. I was able to get everything for less than $150 — a steal, considering I was starting from scratch. Best of all, it only took about two hours to get everything set up. 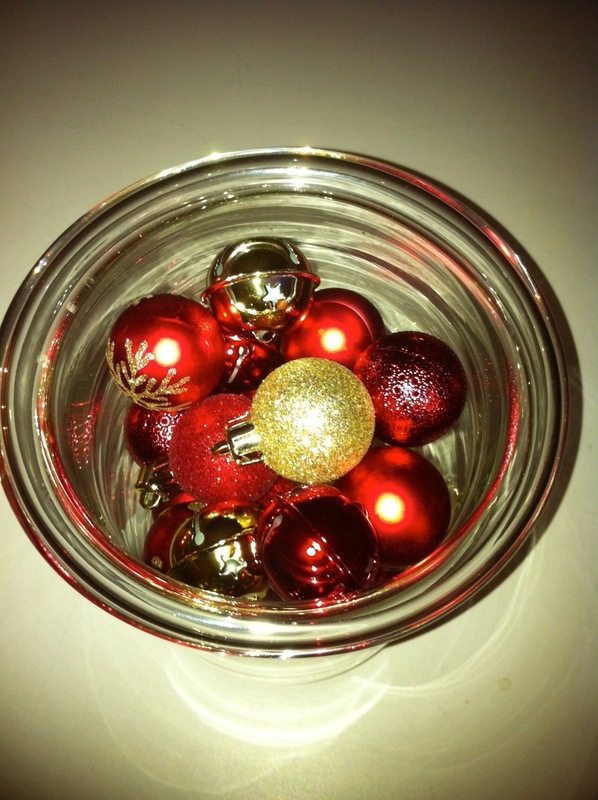 That, of course, includes dropping six of the shatterproof ornaments and a bleeding “oopsie” moment. 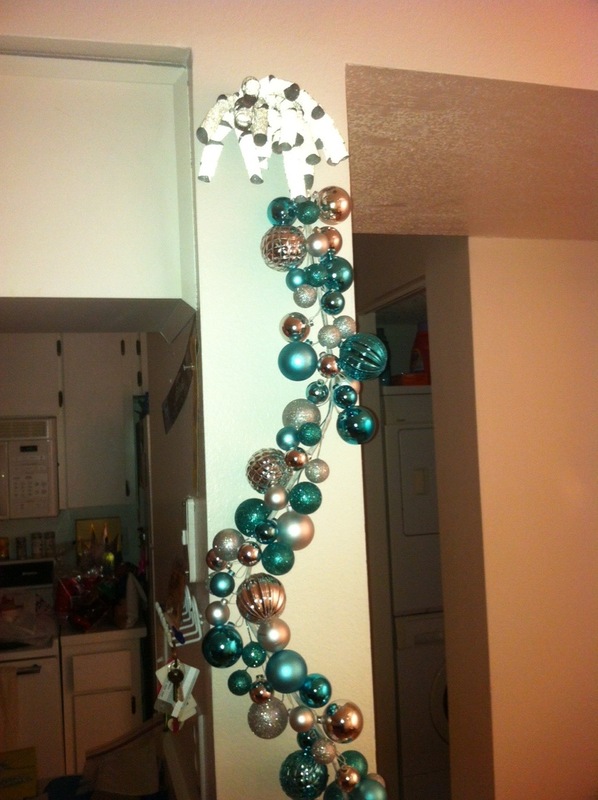 Garland hung vertically, with sparkly ribbon curls to hide the hanging wire. 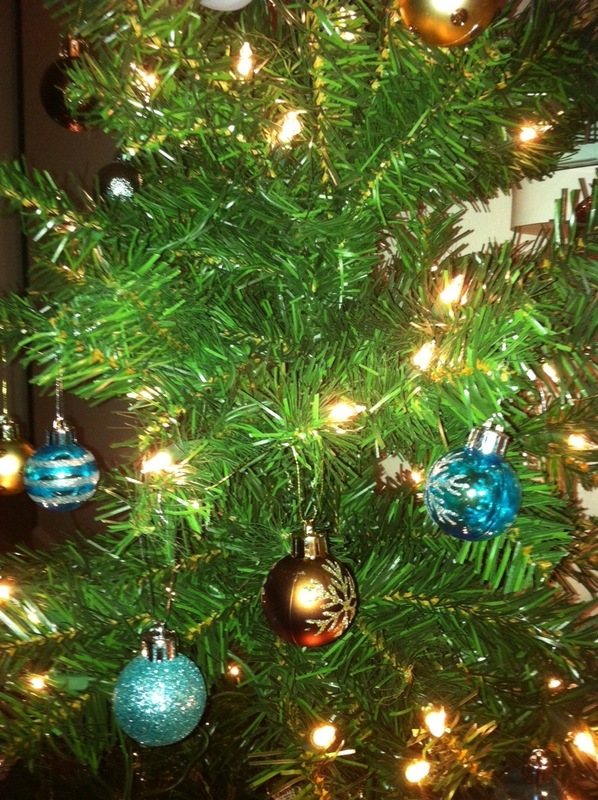 My mini [artificial] tree has turquoise and silver, and brown and gold ornaments. Store-bought toppers are too heavy, so a large silver bow caps it off. 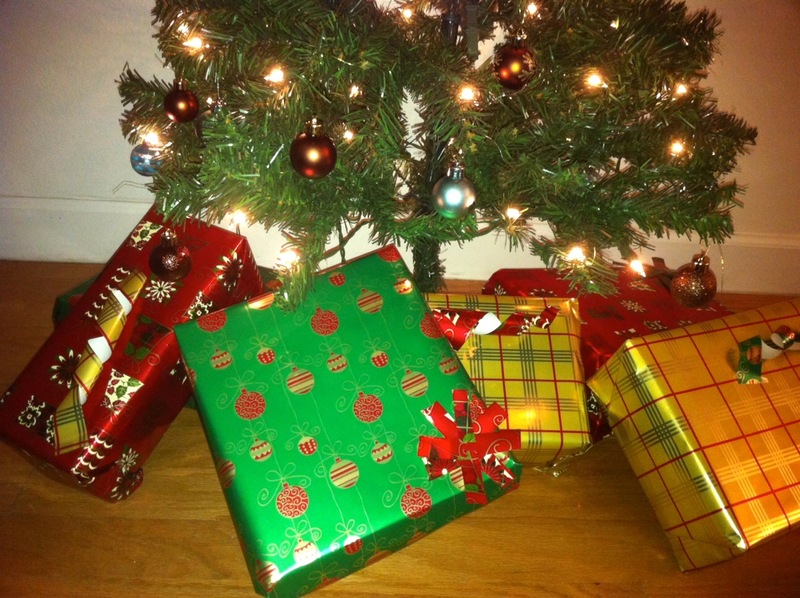 Under the tree are wrapped shoeboxes — the real presents are at my parents’ house. 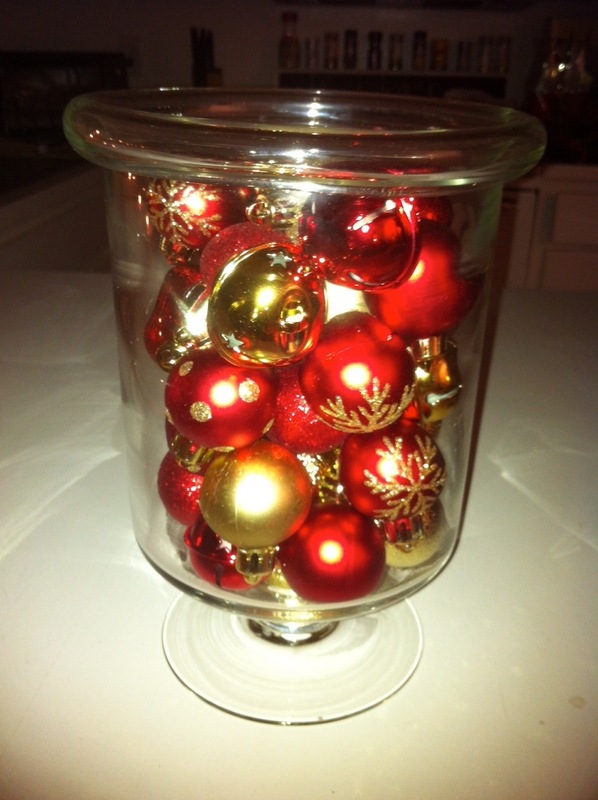 This inexpensive vase is filled with red and gold ornaments, plus matching bells. 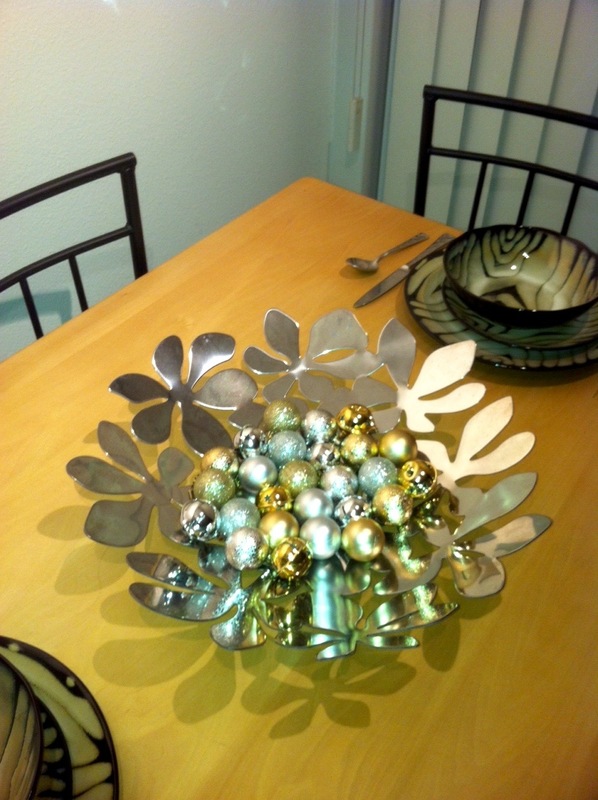 Silver and gold ornaments and bells replace my usual magazines in this IKEA bowl. 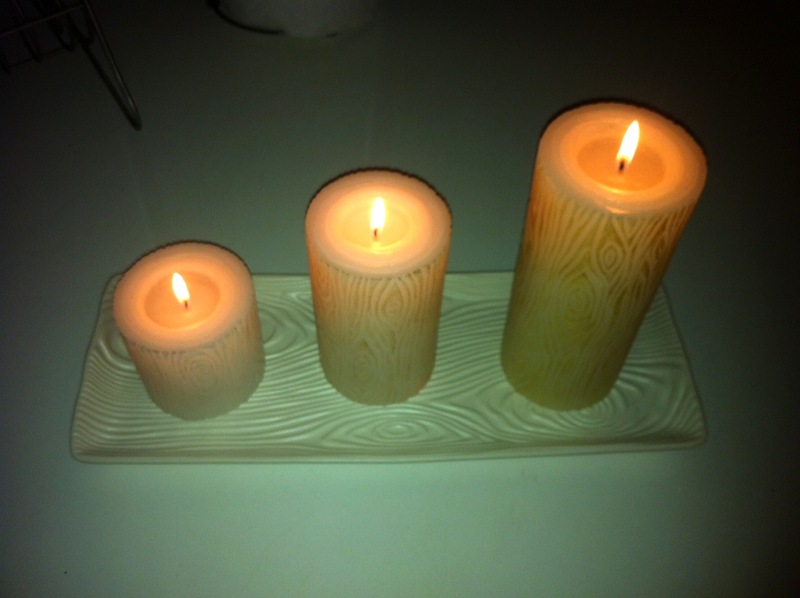 Metallic-dusted “wood” candles fill the space with warmth. Maybe I’m a mini-Martha after all … minus the Band-Aids. Lauren With a Twist says : 12.06.2011 at 7:04 am.p. Adorb! Glad to see you got into the spirit 🙂 love the mini Christmas tree — we bought one last year to deter the pup from eating a real tree. 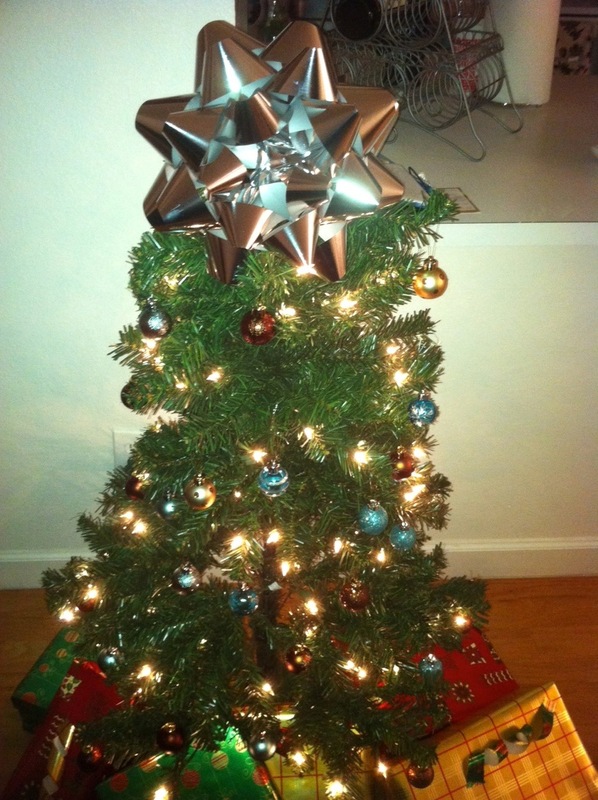 This year, we tempted fate and got a real-sized (artificial) tree. No ornaments have been eaten yet nor has the tree fell over. But there are still 18 days until Christmas so we’ll see! wittyburg says : 12.11.2011 at 2:24 pm.p. Pups make me so nervous at this time of year — I always wonder if they’ll get into everything that’s so shiny and tasty-looking 😉 Glad to hear your first Christmas season as Mrs. Fatkin is off to a great start! Maggie May says : 12.05.2011 at 8:32 pm.p. Looks great! But what are these “real presents at my parents’ house” of which you speak??? wittyburg says : 12.11.2011 at 2:23 pm.p. Well, I don’t plan on having wrapped shoeboxes under the tree at your house! Do you? rachel says : 12.05.2011 at 8:12 pm.p. lookin’ good, mander, i mean martha! wittyburg says : 12.11.2011 at 2:22 pm.p. Thank you muchly, frand! I think she’d be pissed I got an artificial tree, but otherwise pleased.